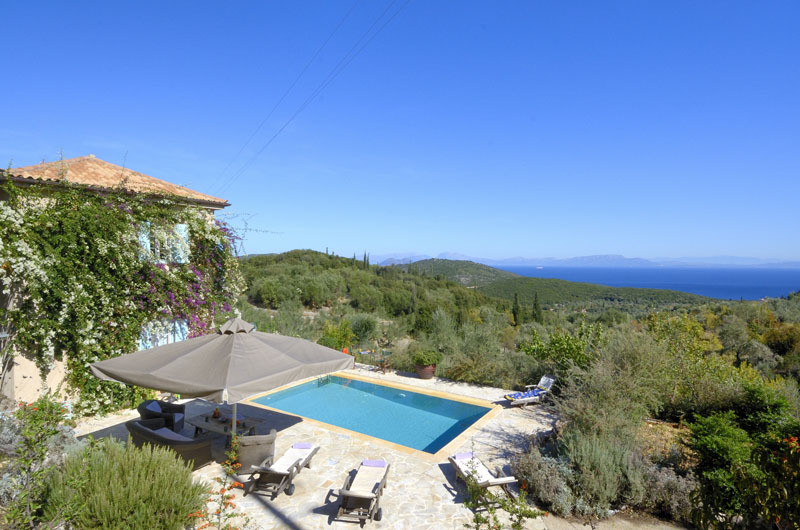 Secluded garden villa surrounded by vineyards and olive groves with glorious sea and mountain views. It’s said that there are one hundred wells in the broad valley known locally as Campos that rises gently behind Vathy until it meets the steeper wooded slopes of the surrounding Marathias plateau. Certainly this is the most fertile area on the island, producing some of the finest wines and olive oils. Set in lovely gardens, amongst olive trees and vineyards, this villa, recently built out of local stone with bougainvillea, clematis and vines covering the walls, blends so well into the surrounding landscape that it seems much older. That same theme is maintained inside the house. Contemporary fittings and furnishings have been chosen to complement older pieces of craftsman made family furniture. The living/dining room is open plan, with a well-equipped modern kitchen. The bedrooms all have air conditioning with windows either looking out over the gardens to the sea or across the vineyards towards the hills. 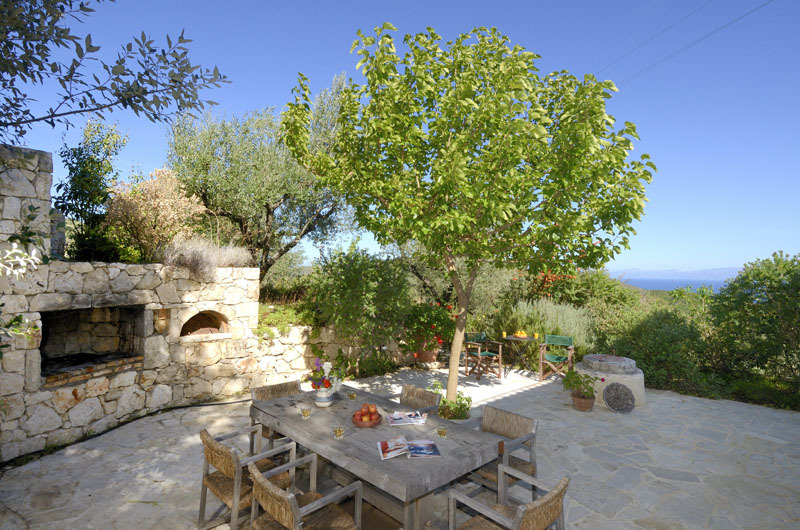 The gardens provide the house with privacy but enjoying one of the finest views on the island, out across the Inner Ionian Sea to the mountains of the mainland. Built on raised terraces fringed by trees, with its own swimming pool and barbecue, there is always a choice between sunshine and shade. This is one of the most peaceful areas of Ithaka, yet the main square on the waterfront in Vathi is only five minutes’ away by car along a quiet country road. This same road winds up the hillside to the plateau above, and one of the most far-reaching views of the island together with many of the sites mentioned in The Odyssey can be explored, Afroditi’s Spring, the Cave of Eumaios, and the spectacular crag of Korak (the Crow). Another lane nearby, driveable part way, leads to the picturesque and very quiet Caminia beach. Away from it all yet close to all amenities is a winning combination. Perfection!